anyway you want ideas: he shouldnt be too young thats for sure, hes in the army after all.. Lets make a character different from other main characters , so no " KImi MAmoru !'' plz. I suggest we put the character in the flying division so he needs flying equipment. well that's what you said? ok well i'll try something without the flying equipement, one step at the time. when i will decide to begin, it's always the beginning that's hard for me, lol. well i don't care what you guys decide for his personnality but i think uncivilised is something to consider, lol, it's gonna bring the facet of humour to this. Personality is always what makes a character an interesting one, even if it is well drew. Well flying division is good but still, we need to find some traits for the personality 'cause it's with that that we're gonna be inspired and influenced to draw the char. BUT if you have any ideas for the char already, just post it and we could find an interesting personality that would fit with it and with the kind of story we want. Alright so Camilon and I will start making some concepts. In the meantime what about the lead female role? I just have a question, if he's a prototype that's supposed to be dead, why is he in the army? Oh and i'll try to put my idea when i'll finish it, i should maybe start it soon. Well we didn't really get the opinion of everybody about the main char that should be a girl or a boy... but what about a girl for the main and a boy for the expriment/secondary character? Bw, I have an idea for the girl and I'll work on that as soon as possible. She's supposed to be in the flying division right? I guess everybody is ok with what we said earlier about the sexe of the characters. Go on welley draw! here's a quick draw of my idea, i've lost some of it but it's alright. It's really ugly but it just to show you my ideas. well as you can see in the top right corner, i did i little symbol. I thought like he could go like in "prototype form" when he attacks and his body has some little modification when in this form. Like the eye could turn to this symbol that could be the symbol from the organisation who did the prototypes. His hand could ressemble a claw-like figure like that little ugly thing in the bottom left corner. Maybe other modifications, if you guys like it? 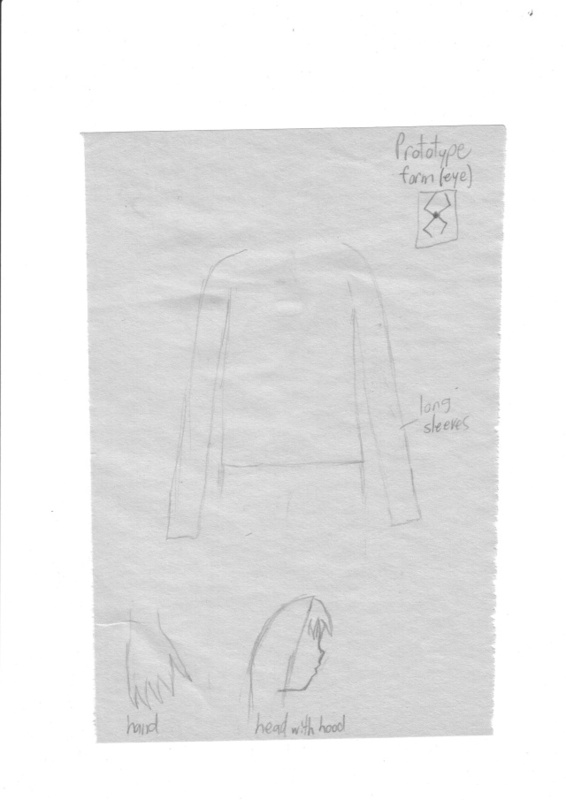 And for his "suit", he could have long sleeves, i think that this gives him like the appearence of agility(lol, that's how I see it, so he could be agile)He could maybe have a hood( just something little that came up, I don't really see the meaning of this so...) and the rest well let's find something. So is this all ok? well for the prototype guy the eyes could be nice but he should always have them. Oh and of course he wouldnt be in the army at the beginning of the story, He could get involved in the armys conflict somehow and then join. what do you guys mean by being us? and what about his outfit, is it ok? If I understand what reven said , you who ''be'' the main guy, so you would like make his decisions and stuff, like if he was you, same for welley. The outfit should be fine. I'll see what I can do about that claw though.. Is it made out of his own flesh? Also is that his main weapon or is there another? Basically I want to come up with the concepts and then we could start making dialogue between one another (playing a role). Between drawing and school I stay very busy.although there is no issue coming up with concepts, working on two mangas at the same time would stretch me. So just keep me updated on the desired look of this guy and I should have it up in no time. The claw is made of his flesh, but i don't know what weapon as a prototype he should have, i would like him to have something else. Ok, i don't mind being the guy prototype. Green, green. I don't know, green like C.C. would be kind of cool. This guy is moody so I'd say black or red, this is Aang's character so don't mind me though. red? yeah for the guy that'd be great but what about the girl? I say purple. Purple!! :p Honestly, I don't really mind, haha.